Most power plants operate on the same general principles: energy-dense fuel is burned to release heat, which boils water to make steam; this steam is used to spin a turbine that generates electricity. In 2013, centralized thermoelectric U.S. power plants 33% of the energy in the fuel is converted into electricity. In other words, the power plants had an average electricity generation efficiency of only 33%, wasting two-thirds of primary energy as heat. Innovative technologies to use this waste heat to generate more electricity could improve the overall efficiency of thermoelectric power production. By leveraging advanced microfabrication processes, the team led by Stanford University will develop a scalable heat-to-electricity conversion device with higher performance at a lower manufacturing cost than is presently available to industry. The team's solid-state conversion device is based on a 20th century thermionic converter design, where an electric current is produced by heating up an electrode to eject electrons across a vacuum gap for collection by a cooler electrode. Historically, thermionic energy converters are limited by heat losses and are costly to manufacture due to the high precision used in their construction. However, by utilizing wafer-based fabrication processes to create a much smaller vacuum gap and enhanced thermal isolation structures, Stanford's thermionic converter will result in improved device performance, lower manufacturing cost, and a scalability for systems producing Watts to Megawatts of power. 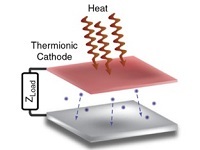 The team's initial focus is on the residential Combined Heat and Power (CHP) applications, but their innovative microfabricated thermionic device could also be used to improve efficiency in high-temperature solar thermal systems as well as convert waste heat from factory equipment, power plants, and vehicles to useful power. If successful, Stanford's energy converters could yield drastic improvements in the efficiency of thermal energy conversion for residential CHP, distributed solar thermal power, and broadly enable heat scavenging. Localized power and heat generation technologies could help households and businesses become more energy self-reliant and less susceptible to energy-related outages. Efficient energy converters would conserve energy and substantially reduce greenhouse emissions. If successful and widely adopted, thermionic energy conversion could displace conventional heat engines, lowering energy costs for consumers.